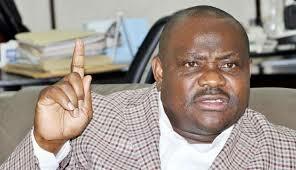 Rivers State Governor Nyesom Wike has said that the protracted implementation of the United Nations Environment Programme (UNEP) report on Ogoni is a grand fraud and deception. Wike, who made this assertion yesterday while addressing the 108 and 109 general session of Rivers State Council of Traditional Rulers in Port Harcourt, urged monarchs in the state to lend their voices in condemning the neglect of Rivers State by the Federal Government. He said it was disheartening that 28 months after the Federal Government launched the Ogoniland clean-up, they were yet to commence the exercise as recommended by UNEP.“It is time you lend your voices more forcefully to the neglect of the state by the Federal Government, the devastation of our environment by the oil companies, the grand fraud and deception in the Ogoni clean-up exercise and the call for economic justice and fiscal federation,” he said. The governor said the state-owned security outfit, Rivers State Neighbourhood Safety Agency, would soon commence operation for the primary purpose of detection and prevention of crimes across the state.He, therefore, solicited the support of the monarchs to collaborate with operatives of the agency to ensure that they succeed, particularly as the operatives are largely their own nominees. Besides, Wike cautioned the monarchs to resist the temptation of engaging in partisan politics, which could corrode their social relevance. He advised the monarchs never to allow any politician to breach the peace in their communities during the forthcoming campaigns and also urged them to mobilise their people to collect their permanent voter cards and vote for the candidates of their choice. Chairman of the Rivers State Council of Traditional Rulers, King Dandeson Douglas Jaja, implored the Federal Government to revive the ports in Rivers State to create employment opportunities for the youths. Meanwhile, the Civil Society Legislative Advocacy Centre (CISLAC) has sought for an Act to back up the activities of Hydrocarbon Pollution Remediation Project (HYPREP) through independence legislation that would allow for more robust and comprehensive engagement in the cleaning of Ogoniland. It said government and oil firms should, as a matter of urgency, start the decommissioning of oil facilities in Ogoni ahead of the clean-up to prevent re-pollution that might cause a setback to the entire campaign, adding that a dedicated CSO desk should be established to interface with the larger public and profile feedbacks as a panacea for a sustainable remediation process.Executive Director, CISLAC, Auwal Ibrahim Musa, stated this yesterday while on an advocacy visit to the Minister of Environment, Ibrahim Usman Jibril, in Abuja.